Veteran Olympian runner Jeff Riseley will lead the cream of Australia’s track athletes to battle it out for line honours at this year’s Leonora Golden Gift Elite Mile. One of Australia's best ever distance runners and a multiple winner of past Leonora Elite Mile events, Riseley is set to lead a stellar field in Leonora on the WA Day long weekend. Hot on his heels is a stacked field of Australia's young guns, ready to take down the twice Olympic runner and claim victory. Field organiser, Runner’s Tribe’s Ross Johnson, said yesterday that some of Australia’s best track athletes were heading to Leonora for next weekend’s Golden Gift Carnival. “We have assembled some of Australia's finest middle distance athletes to showcase their abilities in Leonora,” Mr Johnson said. “This race is a staple on the middle distance calendar and has been won by the who's who of Australian running. The 2016 Leonora Golden Gift’s men’s and women’s Elite Mile races are the twin highlights of the Leonora Golden Gift Carnival, to be run from Friday June 3 to Monday June 6. Runners leading the field at this year’s event include 2015 men’s Elite Mile winner Zak Patterson, former World Beer Mile record holder James Hansen and 2015 Golden Gift finalist Chris Dale who ran second in this year’s WA State 1500m. 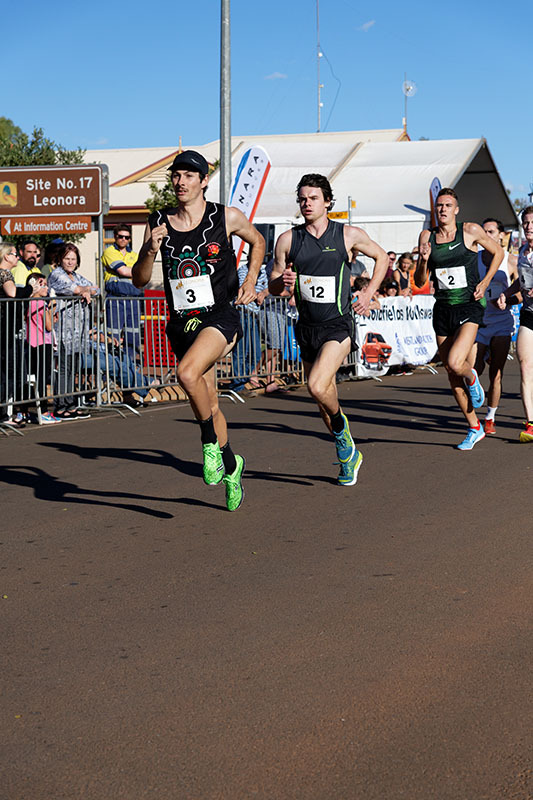 They will be joined in Leonora’s historical Tower Street by top Australian middle distance runner Douglas Hamerlok, veteran NSW athletes Charlie Hunter and Andre Waring, and top middle distance runner Matt Clarke from Victoria. The Women’s Elite Mile is expected to be dominated by top seed Bridey Delaney, current Oceanian record holder and 2013 Australian cross country champion. “The gifted Bridey Delaney returns to Leonora in pursuit of her first ever victory,” Mr Johnson said. Strong competition is expected from Ronan, who achieved sixth place overall in last year’s Australian XCV Nationals and came 22nd overall in the World Schools XC Championships in Hungary last month, while Fitzsimons was the third Australian at last year’s Zatopek 10k National Championships. Another solid contender, Melinda Witchard, was a finalist in the 2016 Women’s National 1500m race and a bronze medallist in the 2016 NSW State Women’s 1500m. The Golden Gift’s Elite Mile field also includes WA athlete Ben Chamberlain who made the Australian team for the Youth Commonwealth Games, WA champion 800m sprinter Peter Bol, national 1500m finalist Jack Stapleton and Tasmanian 5000m and 3000m record holder Stewart McSweyn. In addition, the women’s Elite Mile will include Charlotte Wilson who ran third in the Australian Athletics and Commonwealth Selection Trials, 2016 Australian Athletics Championships veteran Amy Brown, under-20 800m WA champion Phoebe Lawes and Abigail Rose Regan, the indoor mile record holder at Washington State University.